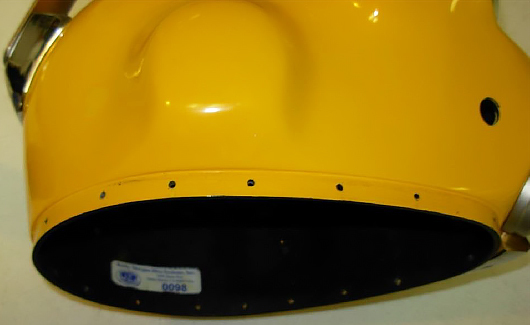 The metal ring on the base of the helmet does not normally require removal for maintenance or inspection unless the helmet ring gets bent or damaged and/or the fiberglass shell becomes in need of repair or a full re-gel coating is to be done. 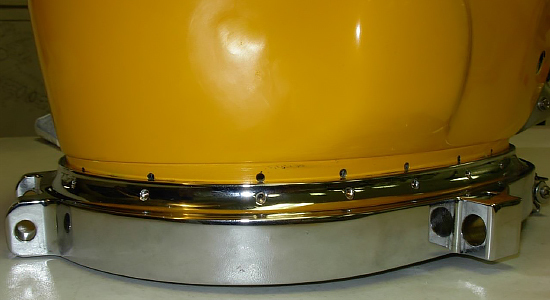 Removing and replacing the neck ring is not normally a difficult project but it does require caution in order to not damage the fiberglass shell. 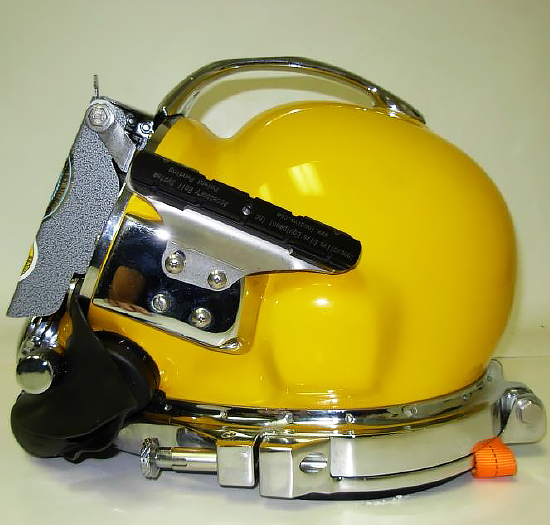 It is strongly recommended that the helmet ring be removed and replaced by KMDSI dealer technicians or persons that have experience servicing KMDSI helmets and have received technician training by an authorized KMDSI training facility. This procedure will guide technicians. Should the technician have any questions please call Dive Lab at 850-235-2715 or email at divelab@divelab.com. 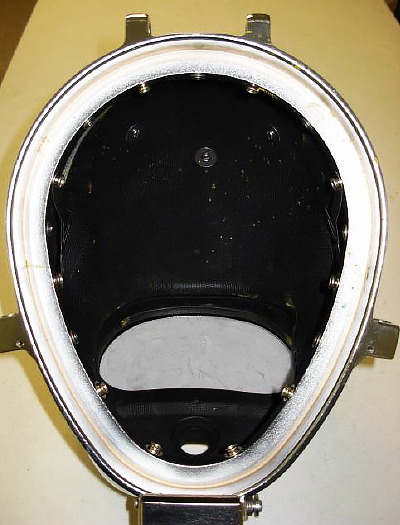 The Base ring removal and replacement procedure works for all the KMDSI fiberglass helmets that use this system, these include the SL27, 17C, 17K, KM37, KM47 and KM57 helmets. Dow Corning® RTV 732 or equivalent multi-purpose sealant. Removal of side block and pull pins will make it easier. 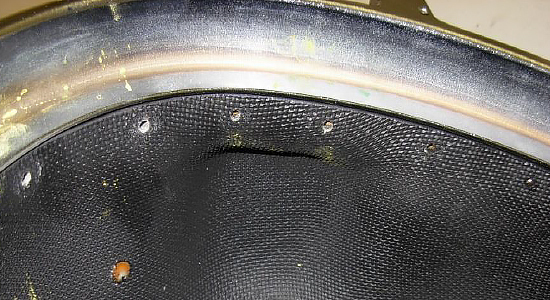 If necessary, clean the shell and base ring with a mild dishwashing detergent and water as explained in the helmet operations and maintenance manual. 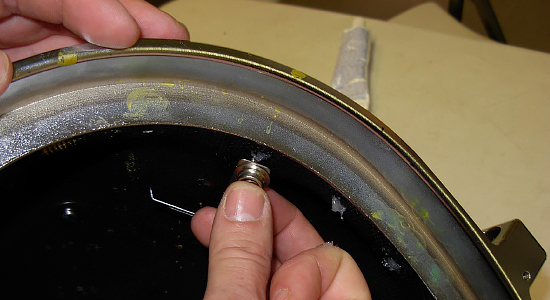 Use only 100% room temperature vulcanizing (RTV) silicone to seal the base ring. 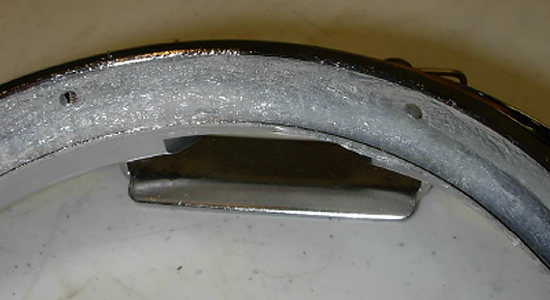 Other sealants could make it difficult to remove the neck ring in the future and may result in damage when removal is attempted. Always use RTV silicone in a well-ventilated area. 1. 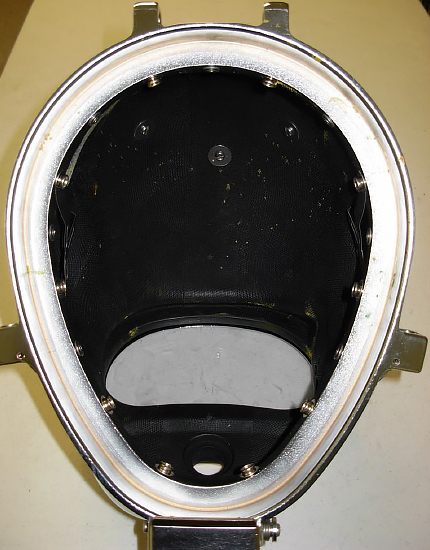 Before the ring removal, it is best to take some pictures of the inside of the helmet to help insure proper relocation of the screws washers and snaps. 2. Using the neck ring as a template draw out the helmet ring shape on paper or cardboard Laying out screws in their correct pattern on a sheet of paper will ensure proper placement of snaps and earphone retainers when installing ring. 3. 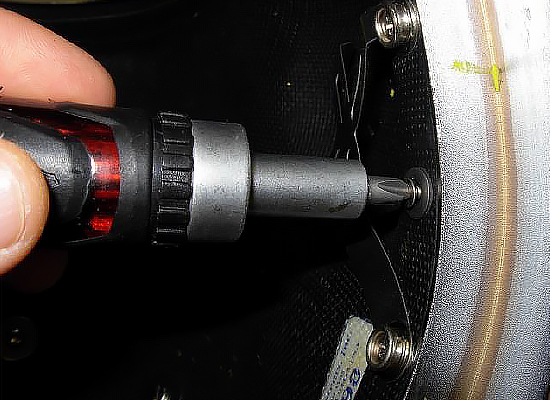 To remove the helmet ring, using the # 2 Philips head screwdriver, first unscrew and remove ALL seventeen screws and washers on the inside of the helmet base. 4. Use only a #2 Phillips head screwdriver bit for the removal of the screws, using an incorrect size bit may damage or strip-out a screw. Screws and snaps in their correct pattern on a sheet of paper cardboard. 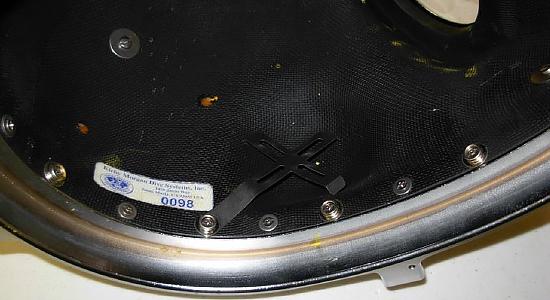 Failure to remove ALL seventeen (17) screws will result in major damage to the ring and shell during the removal of the helmet ring. 5. 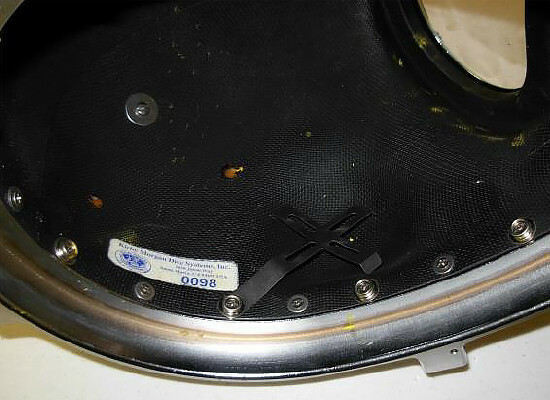 Once all screws have been removed and placed on the template, hold the helmet above a soft landing area like thick floor matt or towels so when the ring comes loose it falls on the matt. 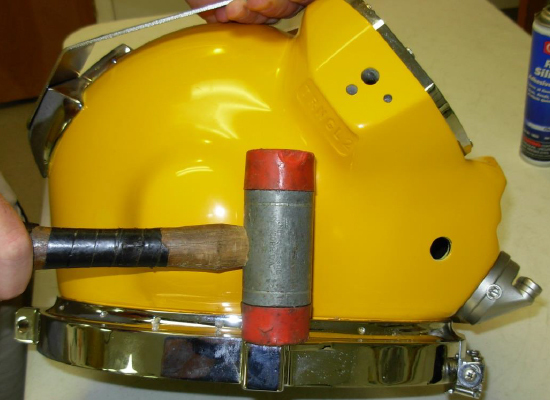 Do not use a screwdriver or similar sharp instrument to pry off the helmet ring, as it will damage the fiberglass, requiring an expensive repair. Use only a rubber mallet. 6. 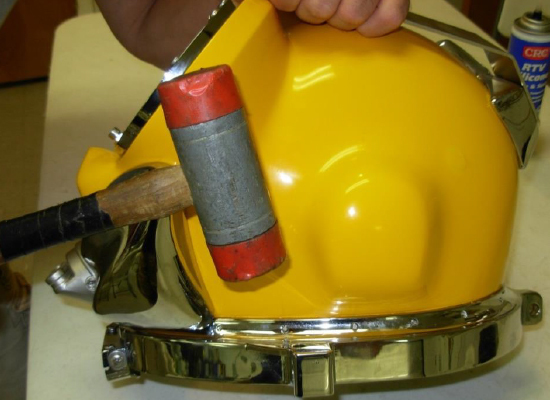 Using a rubber or plastic mallet, firmly tap around the base of the ring, alternating the striking areas to break the seal between the ring and the helmet shell. Tap around the ring evenly and slowly, working the ring off. 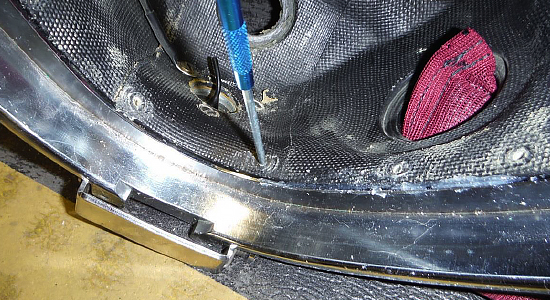 Side block and pull pins have been removed in order to properly remove the helmet ring. 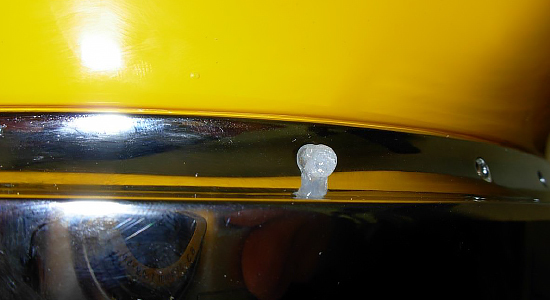 Clean off all loose RTV sealant from helmet shell and helmet ring using a thin piece of wood as a scraper or a plastic scraper. Insure surfaces are free of dirt, oil or other contaminates that would prevent the new RTV from adhering the helmet and ring when reinstalling. Clean using detergent and water if necessary. 7. 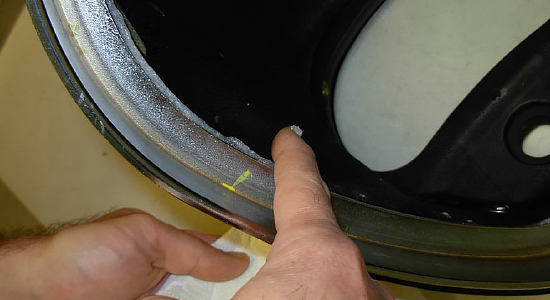 On the base ring, remove the ring and clean off as much old loose RTV (silicone sealant) as possible. If the neck ring is being repaired i.e. removing of snapped screws, straightening of ring ext. Make necessary repairs and document. 1. 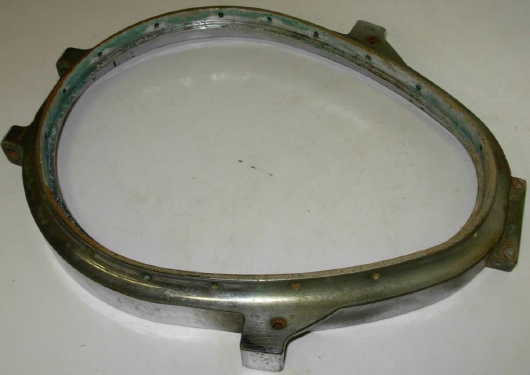 If the old neck ring is being reinstalled, insure the sealing surface is free of loose RTV final abrasive scraping can be done with a wooden or plastic wedge used as a scraper. Final cleaning should be done using a solution of mild dish detergent and water. Rinse thoroughly then blow or air dry. 2. Insure the helmet shell mating area is free of loose RTV and has been properly cleaned with using a solution of mild dish detergent and water. Rinse thoroughly then blow or air dry. 3. Without any RTV applied, test fit the shell to the mount ring to insure it lines up properly. 4. Apply a liberal amount RTV silicone sealant to the inner lip of the ring. 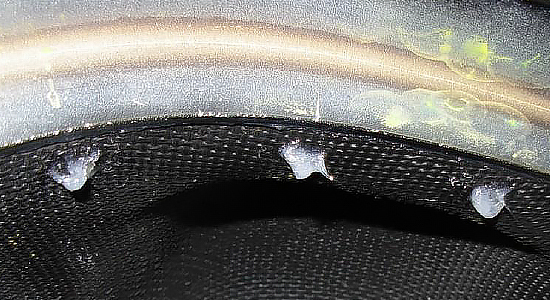 Be sure to apply sealant to the holes where the screws attach to the ring. 5. Put a bead of RTV in the base of the ring, using your finger spread the bead out in the area where the helmet seats in the ring. Ensure screw holes are covered with RTV. Using your finger spread the bead out in the area where the helmet seats in the ring. 6. Align the helmet starting at the front and slowly working to the rear of the helmet. 7. 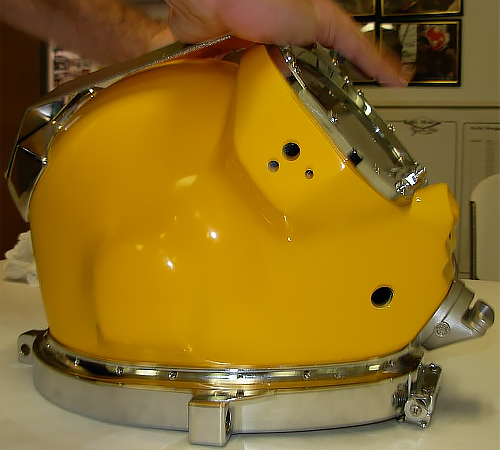 Once helmet shell is properly aligned with the ring, push straight down until the helmet shell is fully seated in the ring. 8. Wipe off excess RTV that is squeezed out. 9. Apply RTV sealant to all the screw holes in the shell, this ensures there will not be any leaks around the screws later. 10. 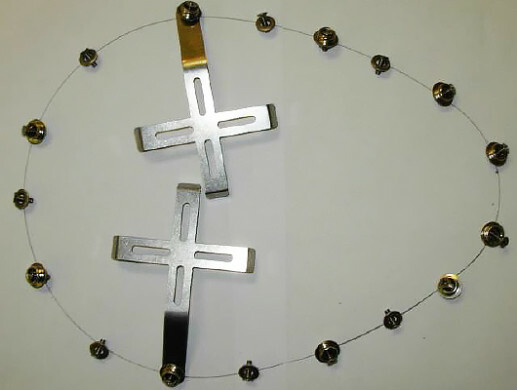 Use the metal scribe to help align the holes, then thread the screws and washers into the ring. Ensure snaps and ear phone retainers are in the proper location (refer to your template for layout). Re-apply silicone in the hole if necessary. 11. First install one screw in the front left side, then one in the right side. This will ensure the alignment of all the holes. Do not tighten. 12. 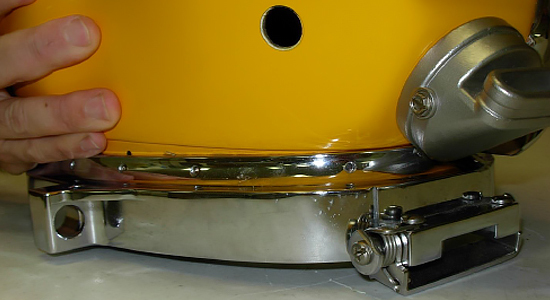 Once two or three screws are installed, the shell will be aligned with the holes. Install all remaining screws. Do not tighten the screws at this time. Once all screws are installed they can be tightened. 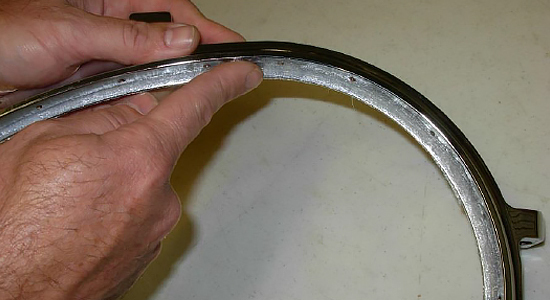 Tighten with a torque screwdriver to no more than 12 inch lbs. 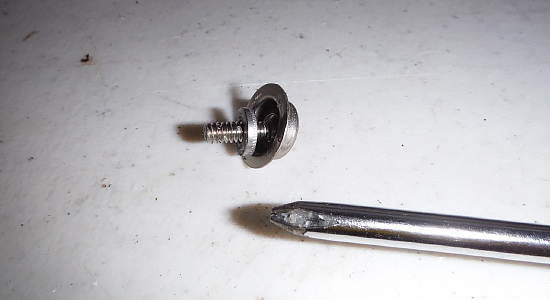 Note: Some torque screwdrivers may be too long to mate squarely on the Phillips head. 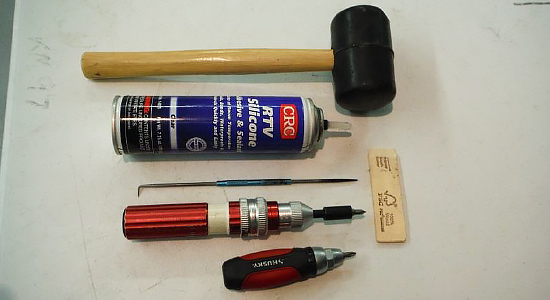 If a torque screwdriver will not fit, tighten screws until they bottom out using the force of three fingers only, that should insure the screws will not be over tightened. The RTV will keep the screws securely in place once set. 14. Wipe off any excess silicone sealant. 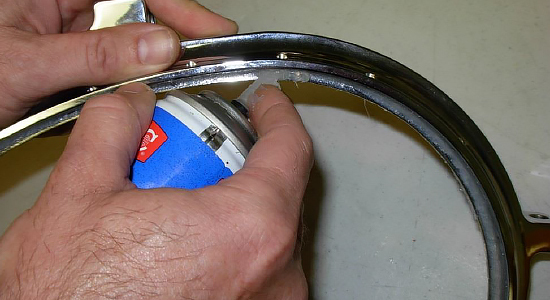 Once the screws have been tightened you should have a small amount of RTV sealant oozing out of every screw hole on the outside of the ring. This a good indication that enough RTV was applied and there will not be any leaks later on. 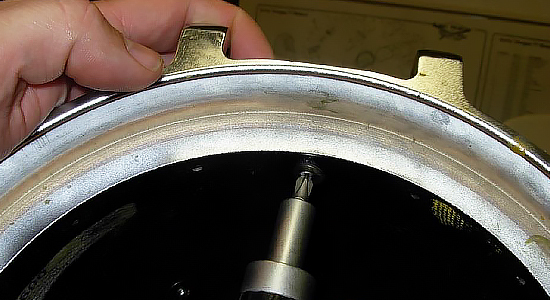 If no RTV oozed out, then remove the screw re-apply RTV to the screw hole and reinstall. Helmet is now ready for reassembly.